Fight Climate Change With a Fork! Home / Articles / Features / Feature Articles / Fight Climate Change With a Fork! Great News for the Planet: You’ve Got the Power! Recent decisions affecting climate change have caused concern to those who are aware of the challenges of decreasing global warming. The really good news is we can still make a difference with our individual daily choices. A United Nations study titled Livestock’s Long Shadow maintained factory farming causes more methane gas production than all modes of transportation combined. A decrease in livestock numbers in the meat and dairy industry will definitely cause a decrease in methane production, deforestation and topsoil erosion. A wiser use of the earth’s increasingly limited resources is to simply stop using more land and more water to feed less people on a meat-cen-tered diet. The explosion of new vegan products, including almond milk, coconut milk, veggie burgers, Gardein, Tofurky, Tofutti Better than Cream Cheese, Daiya cheeses and more translates into replacing meat and cow dairy with healthier and more eco-friendly alternatives easily available in your local grocery store. More good news is that there are major game changers who have hopped on the plant-based living bandwagon, whether it is for health, the planet or the animals. Leonardo is one of them - no, not da Vinci, DiCaprio. Avatar filmmaker James Cameron and his wife Suzy Amis-Cameron are also advocates of plant-based fare. In 2013 Animal Hero Kids, the youth-empowering charity encouraging and recognizing kind action, gave the “School Hero to All” Award to LAUSD Supt. Deasey for his groundbreaking decision to start Meatless Mondays in the Los Angeles school system. 650,000 students began eating vegetarian meals every Monday. This was a first that deserved to be recognized. Then the following year an even bigger first occurred in California. James Cameron, Suzy Amis-Cameron and Rebecca Amis created the first all plant-based school cafeteria in the United States at MUSE school. It was great to meet them when they received the Animal Hero Kids “School Hero to All” award at an annual Animal Hero Kids Awards event at their school. There has definitely been a shift in attitude regarding vegan fare. It is growing at a faster rate today, thanks, in part, to the celebrities voicing why they choose to help the Earth and animals this way: Ellen Degeneres, George Clooney, Brad Pitt, Beyoncé, Jessica Chastain, Joaquin Phoenix and Arnold Schwarzenegger to name just a few. You, too, can be a star to the earth by choosing to eat vegan fare - fight climate change armed with a fork. 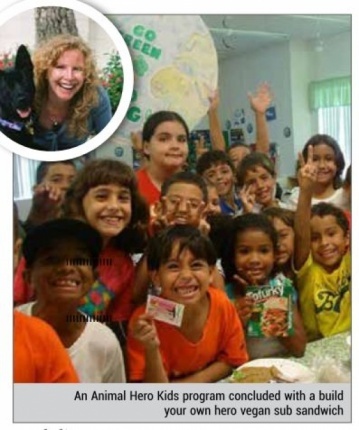 Animal Hero Kids free, kindness programs feature vegan fare activities whenever possible. Please feel free to book a complimentary program at education@ Animalherokids.org or support our programs. Instead of waiting for our government to do the correct thing for the earth, animals and human health, we can all use our own power of choice to create a win-win for all. Please contact Susan Hargreaves at 561-575-5517.